A report on Wednesday claims Apple is accelerating work on a mobile payments system, or digital wallet, that could be ready by this fall, allowing customers to pay for physical goods with their iPhone instead of a credit card or cash. Citing sources familiar with the matter, The Information reports Apple is in talks with partner companies to launch a Google Wallet competitor as soon as this fall, with some saying the service may roll out with the so-called "iPhone 6." The people said Apple is in talks with major credit card company Visa to forge a partnership that could revolutionize the way consumers pay for goods. As noted by the publication, a direct partnership with Visa —or similar company —would be a huge step in bypassing the payment processing chain, saving both merchants and customers money. With partnership talks ongoing, Apple is also working out the technology behind a mobile payments system. Sources say the Cupertino, Calif. company at one point planned to integrate near field communication modules in its iPhone lineup, though another person claims the system is to rely on Bluetooth and Wi-Fi. In either case, sensitive customer information would likely be stored in an iPhone's secure enclave, or alternatively in the cloud. Apple has illustrated similar arrangements in numerous patents, one of which describes a Bluetooth/Wi-Fi solution in great detail. Jibing with today's report, the patent notes credit card information would be stored in the cloud, akin to the method in which users refill or charge to an iTunes account. Apple has long been rumored to be mulling an entry into the so-called "e-wallet" sector, though the company has taken a "go slow" approach. Competitor Google has charged head-first into mobile payments, integrating its NFC-based Google Wallet solution into the Android mobile operating system, while Apple has slowly rolled out additional functionality in its Passbook app. 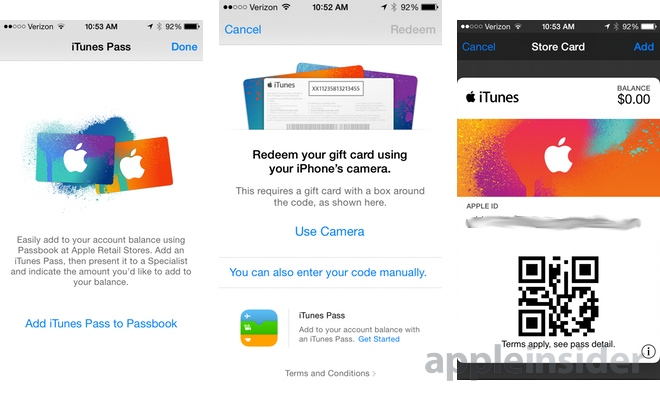 Most recently, Apple debuted iTunes Pass, which allows customers to recharge their iTunes accounts via Passbook by taking an iOS device into any participating Apple Store. Theoretically, if the scan-to-recharge system is broadened to include major retailers, customers would be able to refill their e-wallet while checking out at a store like Target or Walmart. With Touch ID integrated into the mix, mobile payments would be secure, easy to use and, perhaps most importantly, transparent to the end user.